Kiss of the Frog God is several things. First, it is the first Third Party support to appear for Lamentation of the Flame Princess’ Weird Fantasy Roleplaying Game. Second, it is the first scenario to be written and published for the game that has not written by the game’s designer, James Raggi IV. Third, it is part of Postmortem Studios’ “6-Pack Adventure” series, each designed with a “pick-up and play” functionality, which in the case of Kiss of the Frog God includes pre-generated characters, a battle mat, and tokens for use with the battle mat as well as the scenario itself. 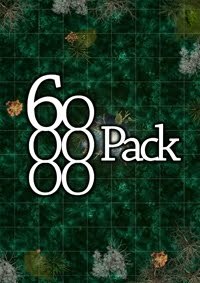 The aim of the “6-Pack Adventure” series, just like that six-pack of cans of your favourite beverage, is for it to be consumed or rather played through in a single session. Designed for a party of four to six characters of third level, Kiss of the Frog God finds the adventurers on a pilgrimage, each of the six pre-generated adventurers possessing a reason to seek religious atonement. One of the stops along the way is the village of Morbury, which sits atop a hillock amid a festering swamp. Morbury was once a reasonably wealthy village, its income coming from farming, hunting, and logging, but the curse of a swamp witch and the near constant rain has turned the surrounding fields and forest into a sodden quagmire. With a down turn in the village’s fortunes, the outlook of the villagers has turned inward and insular. The adventure itself is quite simple. The visiting pilgrims are asked to find two girls that have gone missing, the village priest suspecting that their sinful ways have lead them into the forest. Within a matter of hours their bodies will be found mutilated at the forest’s edge and blaming the swamp witch, the villagers will ask the pilgrims to seek her out deep in the forest and revenge not only the deaths of the girls, but end the curse. Despite its simplicity, there is quite a bit of detail to Kiss of the Frog God. The backgrounds and motivations of the various NPCs are well drawn as are all six of the adventure’s encounters. Plus there is room enough for the GM to add more if needed. In terms of rules, it is simple enough to run for other Retroclones such as Labyrinth Lord or other Old School Renaissance style games, although it is specifically written for use with the Grindhouse Edition of the Weird Fantasy Roleplaying Game. If there is anything lacking in the book it is overall advice on running the adventure and perhaps advice on adding to it or scaling to different numbers or levels of characters. Physically, Kiss of the Frog God is decently put together. The full colour card cover provides a map of Morbury and the battle map, but because both replace the front and back cover, as a product it lacks the title to tell the potential purchaser what the book is called and a blurb on the back to explain what it is, what game it is for, and what level characters the adventure is designed for. Indeed, there is no indication of what level the scenario is designed for until the reader examines the pre-generated adventurers. Inside, there is a lot of white space, but this means that each of the pre-generated adventurers has its own sheet for easy copying, as do the scenario’s monsters and the tokens for both with use of the battle mat. The internal artwork is also good, it being a pity that it appears only in black and white. In terms of editing, Kiss of the Frog God is a little disappointing. There is a certain degree of repetition and whilst I can agree with the author and publisher’s attitude towards homosexuality, I do think that it could have been better handled with a degree of subtlety that should have been applied throughout. The issue here is that in dealing with the sexuality of two of the pre-generated adventurers, the tack taken by Kiss of the Frog God is to preach at both the GM and the potential players. In comparison, almost nothing is said regarding the relationship between the missing girls bar the fact that the village priest considers it to be unclean and unholy. There are plenty of Dungeons & Dragons style adventures that deal with the village in peril to the point at which the format is a cliché. Kiss of the Frog God gets away from the cliché by depicting a low fantasy setting in which the grot has set in and have the adventurers face a very grimy foe perfecting in keeping with the “Weird Fantasy” of the Weird Fantasy Roleplaying Game that it is written for. Pocket friendly and session friendly, Kiss of the Frog God is straightforward and enjoyable. My one complaint about the 6-Pack scenarios is the lack of level information on the RPGNow descriptions. Personally I've picked up most of them anyway, but I could imagine the fact that this information is missing might put people off. I may well run this scenario and Indiecon 2011 in November. This is my first experience with them. The lack of blurb and obvious background information is an error I think. There's a little info on each product page, but a sentence saying "for xth level characters" would go a long way.